The success of Chinese women's volleyball team, especially their gold-winning victory at the Rio Olympics, has brought changes to ace spiker Zhu Ting's home village. Officials flooded in to visit her parents, fixed roads, gave the family honorable titles, and she became the talk of the town, with many saying that they now want daughters. The day China's women's volleyball team played in the final in faraway Rio de Janeiro, Zhu Anliang and Yang Xuelan got up at 5 am. They had received notice earlier that township and village officials would be joining them to watch their daughter compete on TV. The couple were really nervous, both about their child's big moment and about the gathering. They cleaned their yard over and over again and borrowed 50 chairs. It was the first time in their lives they were hosts to this many "guests." In preparation, Zhu Anliang wrote a note and put in his pocket. "If they ask me to say a few words, I'll just read from the note," he told Tencent's Everyday People. Zhu Anliang and Yang Xuelan are the proud parents of Zhu Ting, the ace spiker of the Chinese National Women's Volleyball Team, champions at this year's Games. Zhu Ting is regarded by many as a genius ballplayer and is seen by some as the next Lang Ping, the current coach of the women's team, who in her playing days won Olympic gold when she was only 20 years old and led the team to multiple victories on the world stage. Just last week, Zhu arrived in Turkey to start a new chapter in her life. After being recommended by Lang, she will be playing for Istanbul's hugely successful Vakifbank Club. Zhu's victory has changed her life and her hometown. Her family members have benefited financially from her win and received special attention from local governments. However, this attention has also been criticized, with some arguing officials are actually taking the opportunity to flatter their own vanity. After the volleyball team won the gold medal, Zhudalou village, an obscure and poverty-stricken place, has gained fame as Zhu Ting's hometown. According to Everyday People, the best way to travel to Zhudalou from the Dancheng township seat is a four-wheel drive car, followed by a tractor. The only road leading up to it is made of dirt and riddled with potholes. When it rains, the road often floods and looks no different from the river nearby. But after around 10 kilometers on the dirt path, when one gets closer to Zhudalou, one meets a new concrete road. This new piece of rural infrastructure is one of the consequences of sporting success. The road was built in 2015, when the Chinese volleyball team won the Women's World Cup for the first time in 11 years and Zhu Ting was chosen as the tournament's Most Valuable Player (MVP). 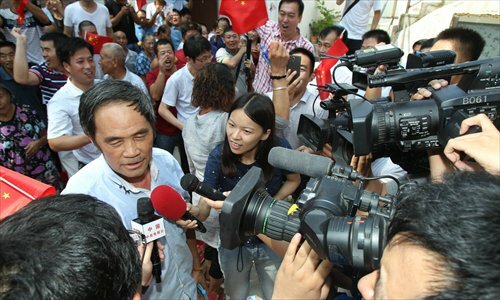 After this victory, Dancheng township officials visited Zhu's house and found the road too difficult to traverse. Afterwards, they allocated some money to the village to fix it up. Some villagers have started calling it "Zhu Ting road." At the entrance to Zhu's house, five banners hang in the air. The last time so many banners were hung in the village was more than 20 years ago, when the local government wanted to push for the Family Planning policy to be obeyed. Back then, the banners read "Fewer children and more trees make you richer." Now the banners read "Follow the example of the volleyball team's tenacity, focus on defeating poverty." Zhu's parents' house has now become the indisputable heart of the village. The parking space next to their house has been swept clean. After the Olympics, the wall on the other side has become a place of fierce competition for companies looking to hang their banners. Visiting representatives of a television manufacturer noted Zhu's parents were using an old TV and the next day sent them their latest model. New appliances are just one way Zhu Ting's family members' lives have changed for the better due to her volleyball prowess. In 2014, Zhu paid off her family's 200,000 yuan ($29,980) of debts and bought her parents a new house. She also bought her father a car. After the Olympics, Zhu's second eldest sister stopped working part-time jobs in the county and will accompany her to Turkey to take care of her. Her youngest sister now has the chance to go to a better school. 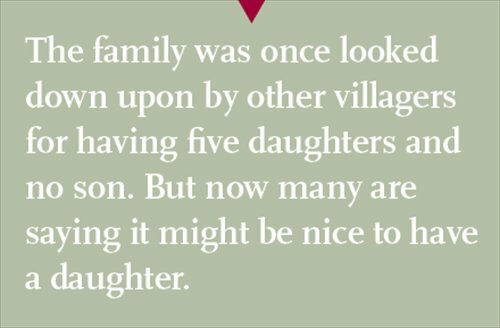 The family was once looked down upon by other villagers for having five daughters and no son. But now many are saying it might be nice to have a daughter. 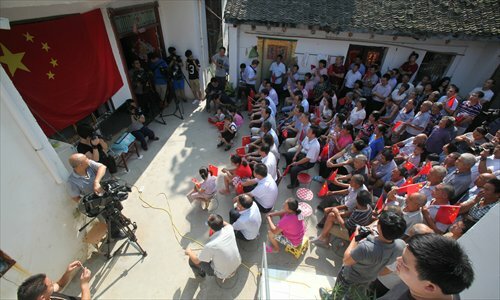 Everywhere in the village and in town, reporters heard people discuss Zhu Ting. They talked about her past life there and the changes she's brought. Some said she's a miracle worker. Born in 1994, a national-level poor county in Central China's Henan Province, Zhu Ting is the middle child of five daughters. Like most of the residents of her village, Zhu's family were not well off when she was growing up. The house they lived in was made of mud and wood and her family earned a living by farming. Her father later opened a car repair shop to support the family. In 2004, after Zhu graduated from primary school, Zhu's father had intended to send her to a southern city for work. But Zhu said to her father "Nothing is more important than learning; I want to go to school." Hearing these words, her father decided to let Zhu continue her education at a middle school in Dancheng township, which is 33 kilometers away from their home. By the age of 13, Zhu had already grown to be 178 centimeters tall, and had shown a great talent for sports. Considering her merely adequate academic performance, her teacher, surnamed Lu recommended Zhu get into sports and introduced her to Zhoukou City Sports School. Zhu's height, outstanding flexibility and physical coordination made Lu firmly believe that volleyball is her best choice. She was later given a place at the Henan provincial sports school. During her training at the provincial school, Zhu suffered serious growing pains. She even called her father, saying "Dad, I can't suffer more, I want to quit." her father told Sina Sports. However, knowing that volleyball could be a path for her and the family to leave poverty, she never went easy on herself in training. In the nine years after Zhu started volleyball training, she spent only two months in total at home, said her mother. "In the first few years, she always came home with many aches and pains." Zhu's mother told Sina Sports. But Zhu's persistency and diligence paid off. She soon became the spiker for Henan provincial volleyball team, and was part of the team that won the silver medal in the national U18 competition in 2011. Two years later, she became the MVP at the U20 tournament, and that same year, she met one of the most important people in her life so far, the coach of Chinese National Women's Volleyball Team, Lang Ping. Ever since the team won gold at Rio, Zhu has been busy. After coming back to China from Brazil, all Olympic athletes met with national leaders. Afterwards, some of them visited Hong Kong and Macao on an organized tour. When Zhu finally found some time, she rushed to Zhengzhou, capital of Henan, where the provincial sports bureau set up a reception and media briefing for her. In the weeks after the Games, the 22-year-old only got to talk to her parents on the phone. On September 8, she finally went home to visit her parents and had a private dinner with her family. Meanwhile, more and more honors flooded to her. The Henan Women's Federation gave her an honorable title that translates to "March 8 red flag bearer." Her family was also honored as "the most beautiful family." Town officials gave her household a tablet that reads "all-conquering spirit." One local real estate developer even offered her family a French-style mansion, to recognize Zhu's exceptional performance in the Olympics. But the amount of attention given by governments and society to gold medalists has received criticism. A reporter wrote on Weibo that he noticed that returning Olympic gold medalists are usually greeted at by a line of officials standing with their family, music and fireworks, but that silver or bronze medalists or other Olympians are rarely given any attention at all. The same could even be said about previous gold medalists. Ye Shiwen, the Olympic women's swimming champion in 2012, also received tons of attention back then. Local businesses even said they wanted to erect a statue of her. But she didn't get any medals this year and her name is rarely mentioned now. Also, in the local news, so much exposure is given to the officials who are giving things to Zhu's family and little to the Zhu family themselves. Her parents have been swamped by so much government attention that they didn't even have much time to spend alone with their daughter. It led observers to question whether this kind of "show" is good for anything but burnishing the vanity of local officials. Whether or not it's an opportunistic political show, the exposure has brought real changes to Zhu's family nonetheless. Nowadays, when walking on the streets in the town, her name comes up most frequently and some villagers are talking about having a daughter. "A daughter like Zhu Ting is better than most sons," has become a common phrase in Zhudalou.